The briefing puts forward the argument that the European Union (EU) should take legal steps to ensure the social inclusion of Roma across Europe. So far the EU has developed a two-pronged approach towards its Roma minorities. On the one hand, it has adopted and requires the implementation of anti-discrimination legislation. On the other hand, it has been working to improve its member states’ policies on employment and social inclusion through the soft-governance instrumentarium of the Open Method of Coordination (OMC). 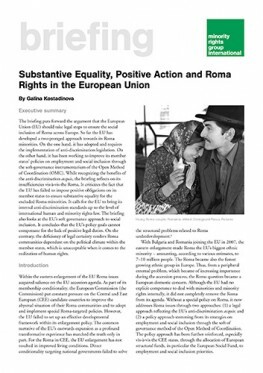 While recognizing the benefits of the anti-discrimination acquis, the briefing reflects on its insufficiencies vis-à-vis the Roma. It criticizes the fact that the EU has failed to impose positive obligations on its member states to ensure substantive equality for the excluded Roma minorities. It calls for the EU to bring its internal anti-discrimination standards up to the level of international human and minority rights law. The briefing also looks at the EU’s soft governance approach to social inclusion. It concludes that the EU’s policy goals cannot compensate for the lack of positive legal duties. On the contrary, the deficiency of legal certainty renders Roma communities dependent on the political climate within the member states, which is unacceptable when it comes to the realization of human rights.